- Unmatched NLP API. I tried API.ai (now Dialogflow), Watson and Azure API (Microsoft) but none is as precise in terms of entity recognition. - Entity Enrichment: Recast.AI adds useful data when an entity is recognized. For instance, if a location is recognized you'll get its latitude, longitude and google maps ID which greatly simplifies its processing. - Efficient training: Recast.AI API was built to be efficient, even on small datasets. You don't need thousands of entries for a very precise recognition, a few dozens are usually enough. 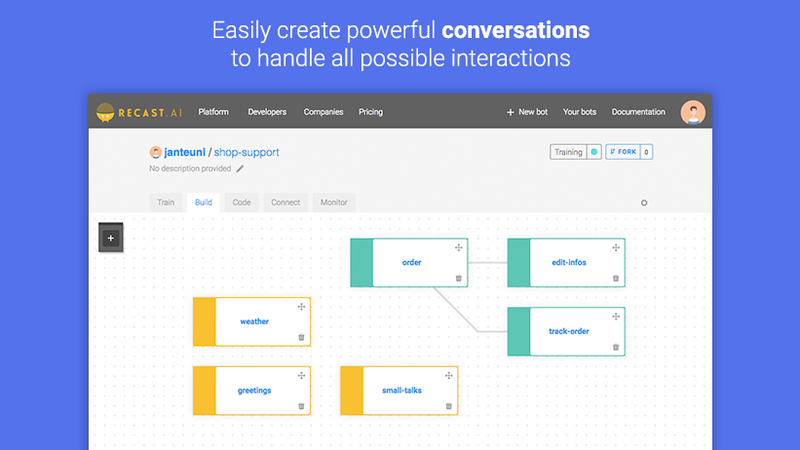 - The collaborative approach streamlines the development of a bot. 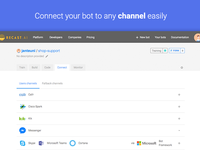 Skills, intents and entities can all be forked which allows you to easily reuse common bot elements built by the community. - Totally free for individuals, with an absurdly high rate limiting (220 000 messaged processed/day): you'll never reach the limit, unless your bot become a worldwide superstar. Cons: - The user interface could be improved, some settings are hard to find and the UX is not always simple. - Documentation/tutorials are not exhaustive yet. 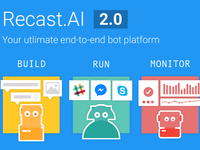 Overall: Thanks to Recast.AI, I was able to build and maintain several multilingual bots, over numerous channels (essentially Messenger, Twitter, Slack, Telegram). 1. 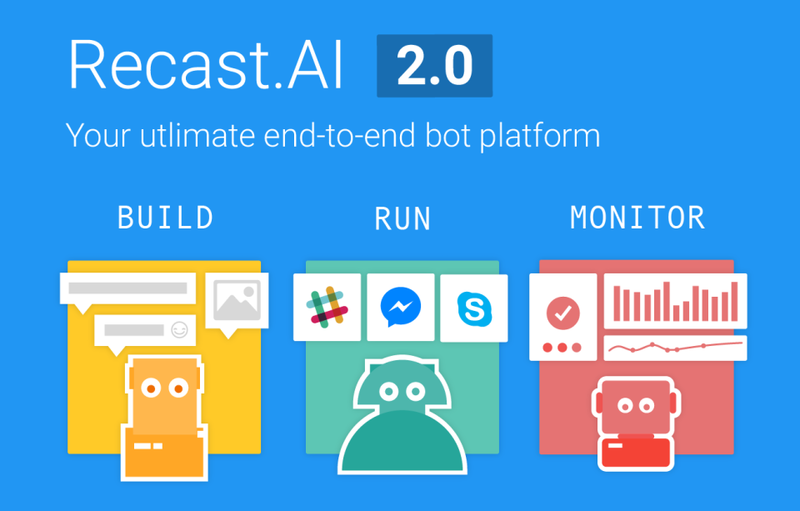 All languages supported - Recast.AI can handle all the languages that exist in the world. How crazy is that? 2. Accelerated training: when you write up suggestions to populate your intent on Recast.AI, it suggests you some automatically, drastically speeding up the training. 3. 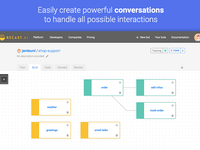 Skills: a new approach to build the conversation flow which took a few days to get used to but now allow me to be much faster when building bots. 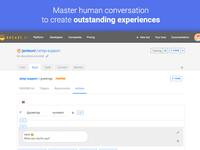 I'm a complete beginner in chatbot creation. 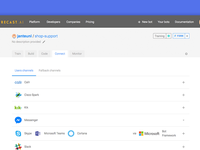 This platform is so easy to use and really powerful. Pros: Creating a bot was incredibly easy. 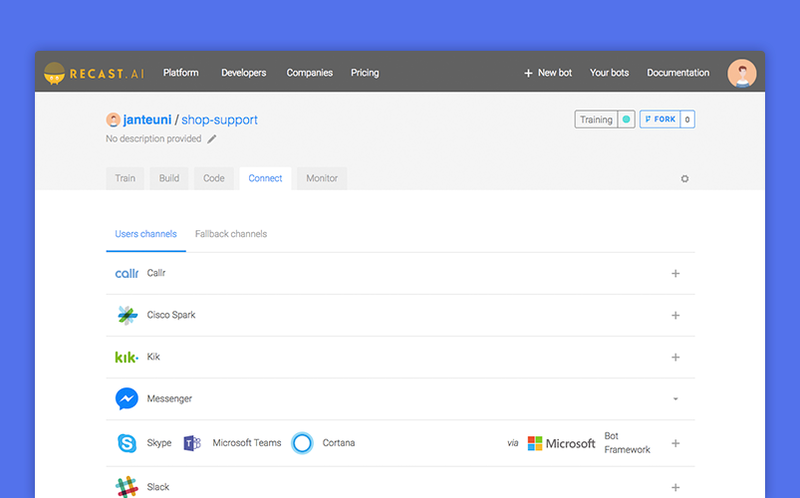 From the inception to the deployment on the messaging app, you're well guided and everything is packaged. The first aspect I appreciated the most was the User Interface and the User Experience : all the needed elements are easy to access and easy to use. The second thing I liked was the Artificial Intelligence behind the interface... I was amazed by the capacity of understanding of the machine, the detection of the intention and the data enrichment. 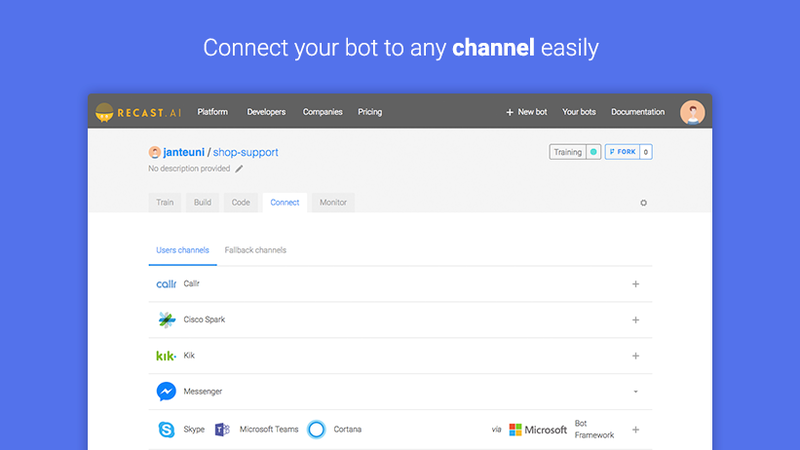 Last point I liked was the step by step guide to deploy the chatbot on a messaging app. Deploy a bot on Telegram took me less than 5 minutes. So easy that even my grandma could do it! Cons: Everything was so easy that I was a bit lost with all the functionalities. It took me a full day to understand by my own all the capacities of this platform. The documentation may need to be a bit more complete with concrete examples. 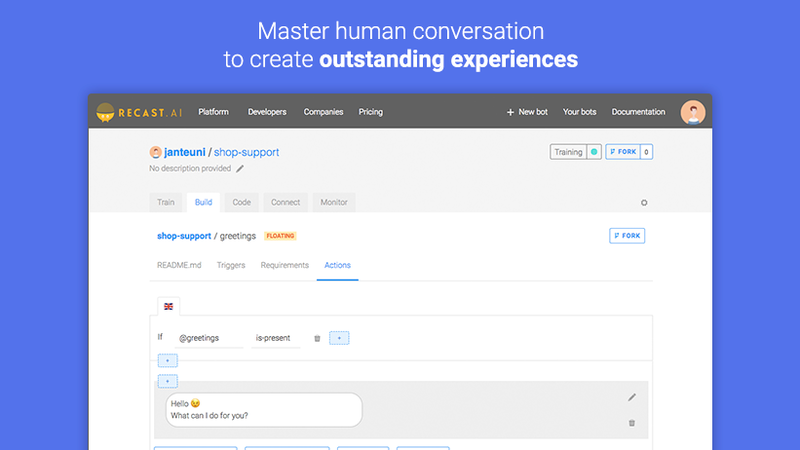 Solid application to build out of the box Chatbots. 2. Dividing bots based on the use cases would be a big plus point too. Pros: I really enjoy the interface and the esay API they give us. Everything is clear and easy to access. The bot builder is so useful because we can easily see our workflow and the links between skills.